OR everyone is applauding the presentation you slaved over at work. All of a sudden, a shrill, high-pitched sound wrenches away those flimsy dreams and your eyelids fight your nerve impulses to remain closed, like they try and fight your alarm clock. However, the apple of your eye, your precious snickerdoodle wrapped in a baby fragrance is bawling. If you find that your baby wakes up crying hysterically, what do you do? You love your kid, but why must he cry when you’re trying to sleep after three sleepless nights?! Or, can he be feeling sick? You probably ask these questions in a far milder fashion than I just did, but I understand your exasperation. It’s a scary world out there, even for the little guy who has mastered the art of saying “Mama!” and “Vroom!”. Sometimes your baby cries just because the poor pumpkin is feeling scared or lonely and wants a little bit of attention. Even nightmares can be very bothersome for babies and lead them to tears, especially when they wake up to find themselves alone. Disorder and diseases can have an exacerbated impact at night and since the baby can explain this in no other way, he/she howls. –Indigestion owing to food stagnation: You can distinguish it by an irritable cry that is not very loud, closer to a wail than a waterworks parade. –Stomach pain (more fancily called a liver-spleen disorder): the distinguishing feature of this disorder that begins suddenly with sharp cries. (It’s a lot like bird-watching, every call means something, as you can see) The child is usually seen curling up, in order to relieve any abdominal pain. –Blocked nose and sinus: a common cold can leave not-so-common repercussions for your baby. If there is mucous congestion that will be made more apparent by the phlegm in their cries, that’s when you know what’s bothering your biscuit. None of these causes are cause for fear and worries, medical care when detected will relieve your child, and soon baby dearest will be back to her beauty sleep. Night terrors are sleep disturbances that are different from nightmares. It may cause your little one to sit up in bed and thrash and cry with their eyes open, but in reality, they cannot see you. They will be more hysterical in a lot of cases if you try to touch them. During night terrors, your baby is somewhere between asleep and awake (a dusk of sorts). This will terrify you, but unlike a nightmare, your child will not remember the next day. There are no definitive causes of night terrors, which probably makes them scarier: but sleep deprivation and fever increases their probability of occurrence. In case your baby is in the midst of a night terror, (they may last as long as half an hour), it will be hard, but it is best not to wake the child up. 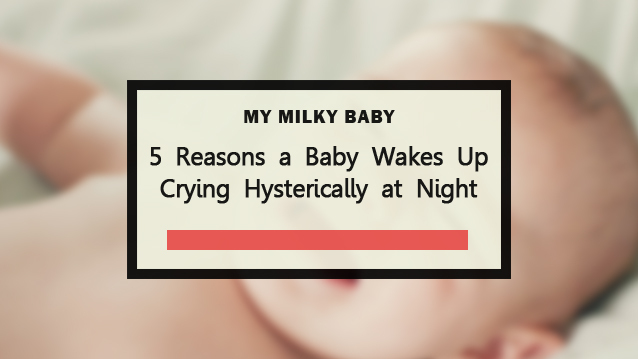 So as you can see, there can be a number of reasons why a newborn or a baby wakes up crying hysterically. However, you and I both know it’s all part and parcel of growing up, and if it’s nappy change time, you did it the last time, so the other person has to go. And if you happen to be the only one, you know who the baby will love the most with their heart! Sweet dreams to you and your little squishable cinnamon roll! Parents often feel anxiety when their baby wakes up crying at night. It is very important to stay calm and avoid making a big fuss about the situation. The first step is to keep the lights off and do not make any loud noises. Parents should slowly build the habit of letting the baby learn to self-soothe and not provide any comfort right away. This will teach the baby steady sleep patterns as he or she continues to grow. If the baby continues to cry, try providing comfort without picking the baby up. The more time the baby is picked up at night, he or she will continue to be restless and expect a reaction. Knowing what to do when your baby wakes up crying is an important step towards creating good sleep habits that will continue as he or she grows. If the baby wakes up crying hysterically on a consistent basis, it is time to search for alternative ways to provide comfort. It is important to narrow down the overall cause of the hysterical crying and consider that it may be due to teething, illness, infection, or an uncomfortable temperature in the room. Narrowing down the root cause will help parents to strategize and come up with a plan the will help the baby sleep better at night. If the baby is teething or currently has an infection then the sleep patterns will stabilize once the issues are addressed. Take some extra time to make sure the temperature in the room is not too hot or too cold for the baby. Keeping the room at a steady temperature is an excellent way to help the baby sleep all night long. One of the top things parents look forward to is the first night the baby sleeps for eight hours straight. At three or four months old, some babies will begin sleeping longer throughout the night. Once the baby is over six months old he or she should begin to stay asleep all night long. It is important for parents to remember that each baby is different and will transition into regular sleeping patterns in their own time. If the baby is drinking formula, they may sleep longer throughout the night. Babies that are breastfeeding often need to be fed more often. Parents should pay close attention to how long the baby is napping during the day. Limiting the time the baby naps will help to increase the number of hours he or she sleeps throughout the night. One of the best ways to help the baby build good sleeping habits is to create a consistent bedtime routine. The first step is to schedule a bedtime that is not too late at night. An over-tired baby will often lead to a restless night and parents often make the mistake of keeping the baby up too late. Create a routine that works well for the entire family. A consistent night time ritual may include a bath, singing a song, cuddling, reading a book, or rocking in a chair. Take some time to experiment with what will work best for the baby and focus on making it a soothing and enjoyable experience. Throughout the process of building a bedtime routine for the baby, it is important to be flexible. It may take some time for the baby to adapt to the changes but consistency is the key to helping babies build solid sleep patterns that will last for many years. Parents should be patient and focus on long term results as they continue to plan out the best possible bedtime routine. Honestly this was SUPER annoying to read! Could do without all the metaphors and attempts at dry humor.. Im trying to figure out why my child is behaving the way she is and I can’t get through a single sentence without running into a jokie joke.. Cmon now! I understand it makes for a more interesting read but there’s a time and place.. Thank you Mark for sharing your opinion. I just stumbled upon this post at 3am after my boy did the biggest out of character cry. He’s fine now! Thank you so much to the individuals that wrote this article! This article has helped remind me of techniques and giving me new ideas to help my baby thank you so much! This had so many things I hadn’t thought of! Thank you! I loved the humor! and new tips to seek out for my sweet cinnabon baby! Very helpful my baby woke up after being asleep for only 10 to 15 minutes asleep. 1) I don’t think it is anything to worry about, as long as the child can be calmed down quickly. A lot of times he just needs to burp. 2) If you gave her a pain medication and she didn’t do it again, I’d imagine it’s pain likely from teething. 3) If it happens again, it could be an ear infection. Nothing makes a kid scream bloody murder like an ear infection. Thank you Carla for the positive comment. My Dear son was under medication for cough and cold for two weeks. For the past week he has been waking up at 3 am howling and crying for no apparent reason. He would not calm down whatever we do. It was not pain, gas or teeth related as he would point these out and the cry would be different. Turned out that he was having acidity due to the two weeks of medicines earlier. Some rantac before bed for two days and the problem ended.